Best Company Fixed Deposit Schemes in India - Should you invest? You are here: Home / Fixed Income (Bank FDs,RDs,PF etc) / How to choose best Company Fixed Deposits? A very high percentage of Indian household savings are being invested in Bank Deposits. For most of the investors safety of capital and guaranteed investment returns are the top most priorities. In recent years, investors have started taking a hard look at Company Fixed Deposits too. The Company FDs are similar to Bank FDs. The interest rates offered on Bank time deposits have been moving southwards and this is making many retail investors to look out for better alternatives to Bank deposits. Why are corporate FDs preferred against Bank FDs by many retail investors? Answer is, the company Fixed Deposit schemes offer higher interest rates when compared to Bank Fixed Deposits. But we all know that generally, the higher the risk of an investment, the higher the potential return. So, what are the risks associated with Company Fixed Deposit schemes? How to choose best corporate FDs? What are the factors that you need to look into before investing in Company FD Schemes? How to choose best Company Fixed Deposit? You can consider below points to identify suitable Company FD schemes. 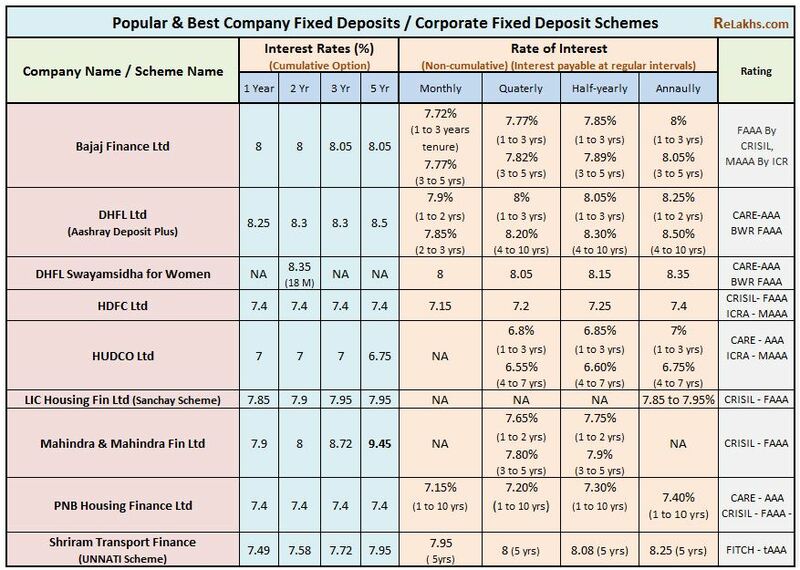 Interest Rates : Rate of interest is the main attraction of Corporate Fixed deposit Schemes. They try to offer interest rates that are higher than the average interest rates offered by Banks. But if a company is offering say 12% pa interest rate which is way above the prevailing deposit rates then it is advisable to be cautious. Time Frame Vs Interest Rate : Generally, longer the duration of investment, higher the rate of interest offered on Company FDs. The biggest risk on Corporate FDs is DEFAULT RISK. The company offering FDs may not service the interest/maturity payments. So, do not consider investing for longer duration like say 10 years or so. Diversification : It is better to invest in couple of good schemes instead of investing the entire amount in one scheme alone. Credit Ratings : Before investing in a Company deposit scheme, you have to look at the company’s pedigree and profile. You need to know why the company is accepting the deposits from the public. If you think it is not possible for you to do this homework then invest your time to understand the credit ratings that are shown by these FD schemes. Remember, if the credit rating of a corporate FD scheme is good then that particular scheme may offer lower interest rates when compared to a poorly rated FD scheme. So, higher the rating, lower the returns. Ratings are given by credit rating agencies like ICRA, CRISIL, CARE etc., Below are the credit rating scales for your information. MAA – The high credit quality rating assigned by ICRA. The rated deposits carries low credit risk. MA – The adequate credit quality rating assigned by ICRA. The rated deposits carries average credit risk. MB – The inadequate credit quality rating assigned by ICRA. The rated deposits carries high credit risk. MC – The risk-prone credit quality rating assigned by ICRA. The rated deposits carries very high credit risk. MD – The lowest credit quality rating assigned by ICRA. The rated instrument has very low prospects of recovery. FAAA – Highest safety rating – This rating indicates that the degree of safety regarding timely payment of interest and principal is very strong. Special Features: Some corporate FD schemes offer special interest rates for Senior Citizens, Share holders, employees of that company etc., Go through these details and avail these benefits. For example : All the deposit schemes listed in the above table offer 0.25% over and above the normal rates for Senior Citizens. Premature withdrawal : Most of the company Fixed Deposits Schemes have lock-in period (like 3-6 months). Also, they levy penalty charges for premature withdrawals. Do look at this clause before choosing the schemes. These details are provided in the Scheme’s application form. Calculation of Returns: ‘Rate of interest’ is the main selling point of these schemes. So, I have observed that these schemes generally highlight the Effective Annualized Yields. Let’s understand the difference between nominal interest rate and effective yield. Example: Let’s assume that above are the interest rates offered by a FD scheme (Cumulative). They display Effective yields on deposits. If you observe the effective yield rates are higher than the interest rates. Lets us understand this concept. As per this scheme, a Deposit of Rs 10k becomes Rs 15,742 after 60 months (5 years). It’s s a gain of Rs 5,742 (Rs 15,752 -Rs 10,000). One year gain is Rs 1148 (5742/5). In percentage term it is 11.48%, which is shown as EFFECTIVE YIELD. Always compare two Company FD schemes in terms of nominal interest rates. Do not go by effective yields. Also, these yields are not tax adjusted. Taxation : Are company fixed deposits taxable? Remember that tax benefits are not available on company fixed deposits. TDS is not applicable on interest earned upto Rs 5,000 pa. You have to club the interest earned on these deposits as ‘income from other sources’ and file your annual Income Tax Returns. Type of Schemes : There are two types of schemes 1) Cumulative and 2) Non-Cumulative schemes. Under Cumulative Deposit scheme, the interest is paid along with the principal amount on maturity date. Whereas under non-cumulative schemes, the interest amount is paid periodically (monthly/quarterly/half-yearly/yearly). If you require money on a periodic basis then you can opt for non-cumulative option. Unsecured : Most of the Corporate FD schemes are unsecured investments i.e., if the company defaults, the investor cannot sell the documents to recover his capital, thus making them a risky investment option. In case of bank deposits, upto Rs 1 Lakh is guaranteed by RBI’s Deposit Insurance & Credit Guarantee Corporation (DICGC). Is it possible to buy Company Fixed Deposits online? I believe that the entire investment process is not completely online. The process may not be like the way you buy and sell shares. Some amount of offline work is involved. You will receive physical deposit certificate after the investment is made. And before the Deposit maturity date, you have to physically courier the FD certificate to the company (Registrar). The company may directly transfer the monies online through Electronic Clearing System (ECS). If you have opted for non-cumulative schemes then company may pay the interest amounts through ECS or through Warrants (cheques). How to check if a Company can collect Deposits from the public? In India, Fixed Deposits or any kind of Schemes where an investor gets fixed rate of interest become an instant hit. Small time investors get attracted to high interest rates offered by the Companies and invest their hard-earned money in Deposits Schemes (Collective Investment Schemes). Some of these entities are genuine and whereas some entities collect monies from the public without getting the necessary approvals from the Regulators. To curb illegal and unauthorized pooling of funds by unscrupulous firms, the Reserve Bank of India has recently launched a website, www.sachet.rbi.org.in , which will facilitate filing, tracking of complaints, besides providing information about the entities registered with a regulator to accept deposits. 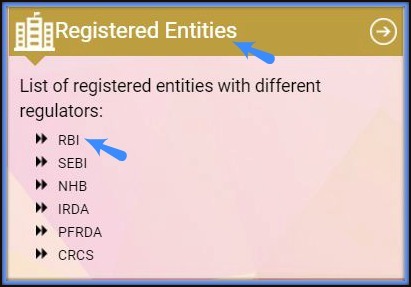 Navigate to ‘Registered Entities’ section. M&M Fin Services Ltd is an NBFC and is regulated by the RBI. So, click on ‘RBI’ link. You will be redirected to RBI’s site. 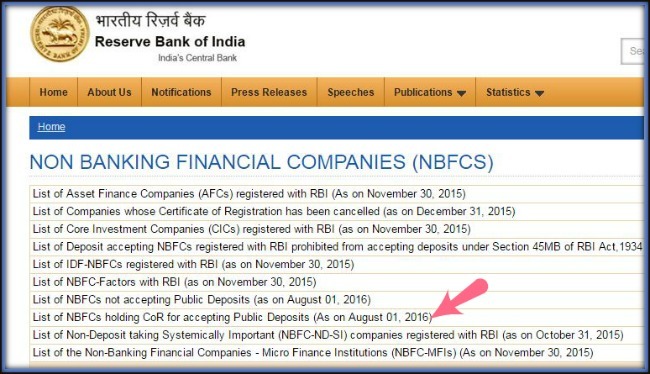 Click on ‘List of NBFCs holding CoR for accepting Public Deposits’ to download the list (excel / PDF format). You can notice that M&M Fin Services is holding CoR (Certificate of Registration) to accept Deposits from the Public. Are Company Fixed Deposit schemes totally risk-free & safe ? As discussed above, ‘default risk’ is the main issue here. There are many incidents where top companies were unable to honor the interest/maturity payments. Investors of Fixed Deposit Schemes offered by Agrigold, Birla power Solutions, Kirloskar Investments and Finance, Micro Technologies, Plethico Pharma, Omnitech Info etc., are still fighting for their monies. Do not invest in a company FD scheme which offers unusually high rates of interest. Avoid FD schemes offered by companies which you are not aware of. Do not invest in FD schemes which do not have credit ratings. I personally believe that one can seriously look at other fixed income options like 8% GoI Bonds, Post office MIS, Senior Citizen Scheme, Secured Non-Convertible Debentures or Debt Mutual funds before opting for corporate deposits. The MF schemes are managed by professionals and they will do the required research on behalf of you. Some of the mutual fund schemes do invest in Company Fixed Deposit Schemes also. Have you invested in any of the company fixed deposit schemes? 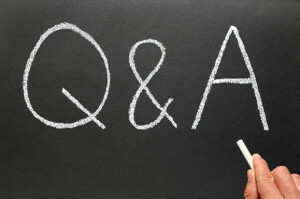 Did you face any interest or maturity amount payment issues? Are you planning to invest in a FD scheme? Do share your views and comments? Why you should not invest in Fixed Deposits & Recurring Deposits for long-term? Hi, I am a housewife. I have around 2.7 lakh in my savings account out of which I am thinking to invest 2.5 lakh in fd for 5 years. Another thing’s that I also want to invest 5k monthly in rd for 2 years. Now I dnt know anything about this tax n stuff. I tried internet but still this part is not clear to me. 1. Will I be exempted from income tax. If not how much would the tax amount to(rough estimate)? 2. The tax will be levied on the interest only or the whole amount .? 3. Is there any way for tax saving? 4. Or any other way for me to invest keeping in view the above point. Can you please enlighten me on these. 1 – If you invest in a 5 year Tax saving FD then you can claim up to Rs 1.5 lakh as tax deduction u/s 80c. Tax benefit is not available on other term FDs. Kindly note that the interest income on FDs/RDs is a taxable income as per the income tax slab rate applicable to you. The tax is levied on interest income alone. Thanks sreekanth. I checked the same with SBI, but it was written that for tax saving fd the max limit is 1.5 lakh. So, can I apply for two separate fds , one with 1.5 lakh and another with 1 lakh under the tax saving scheme for the same account ? 1. Auto nenew principal and interest. 2. Auto nenew principal and repay interest. You can claim tax benefit of up to Rs 1.5 lakh only on 5 year Tax saving FD. So, you may book other type of FDs beyond Rs 1.5 lakh. As, premature withdrawal of tax saving FD is not allowed (except on death of the Depositor). The investment is locked of 5 years. Your interest gets compounded under both the above options. These are related to – on maturity of the FD say after 5 years, what would you like to do?? Hi sree, I am 29 years old .i have invested five lakhs in bank FD . this amount will get mature by next month, the objective of this money to purchase a house after 4 years,can you please advise me best invest funds to invest to make good returns. If you can afford to take little bit of risk, you may consider combination of FD + Secured NCD issue for 3 years + Arbitrage fund. (1) I have 2 fixed deposits maturing in March, 2017. Company has verbally told me to renew it for another 1 year. My option is either to accept that offer (as they were paying my interest regularly for 3 years) and face the situation as it develops or just credit the post dated cheques for the principal amount given by M/s DSK in my bank account citing that I need my money urgently (my 90 year old mother is in Nursing Centre and I am required to spend Rs.25K per month on her). Now what am I to do if the 2 cheques bounces and the principal amount is not credited into my account on maturity. The company has not declared itself bankrupt. It is only partly a defaulter. The company has good reputation in Pune and outside Pune for the last 30 years and is a group of 20 different companies as their website will show. (2) Given the company’s heavy investment of almost Rs.10,000 crores in their 250 acres Dream City township in Hadapsar, Pune, I am optimistic that it is only a passing phase due to demonetization. M/s DSK told me verbally (i) that the company deposits are locked in cement, iron and piling inventory of unsold flats and hence they are facing problem in repaying interest (ii) Cash financed by Marwaris has evaporated and (iii) other sources of finance is costly. The situation is likely to improve by mid-2017. The total fixed deposits received by the company from public is around Rs.400 crores. Can I tell the company to make a suitable proposal to its investors to accept flats or other suitable assets of the company for the money invested in them? What is my best option if the present delay of 15 to 30 days in interest payment is extended to 60 days or even more ? Kindly do not go by verbal promises. Yes, suggest you to ask them something in written or arrange for some other assets as ‘alternatives’, if mutually agreeable. In case, if you do not get proper response, kindly do not hesitate to submit your grievance to the regulator. I am in the same boat with DSK though my FD’s maturity date is Aug. 2017 (still 5 months to go). I was also wanting to know what options I have. Can I get a flat in lieu of my principal + accrued interest, in case DSK is not able to return my FD principal + interest? Let me know if there is any group that you are a part of that has more DSK FDs investors like us? Dear Gopalkrishnan ..Age is the criteria here…individuals who are 60 years and above are considered as Senior Citizens. I have deposited some good amount in ABT Limited,Coimbatore.They give 11% interest for 1 year.They do not disclose their financial status.Can I invest further in this company.Please advise me. I do not have info about the Deposit scheme offered by the said company. If I am in your place, i will avoid investing in the deposit scheme. Kindly check if this deposit scheme is an approved one or not. I am 58 years old and my husband is 65. We both have been investing in HDFC FDs for quite a few years. Now we would like to invest 5 lakhs each in some other Company FDs for a maximum of 2 years. Can we invest in Shriram Transport Ginance, LICHFL, PNBHFL or Bajaj Finserve. Your guidance please. May I know the investment objective? Are you looking for periodic income or just for accumulation purpose? The mentioned ones are good ones. But do not invest the entire corpus in one Scheme alone. You may also consider Secured NCDs. It is for accumulation purpose. I think it would be better to invest in 5 to 6 good mutual funds where the returns are better and safe too. Can you suggest any 6 MFs? Dear Mohana ..Are you referring to MFs or Company FDs? Mutual Funds are subject to Market risks- My opinion! CAN U ADVISE ME ABOUT TRACK RECORD OF FIXED DEPOSITS OF TAMIL NADU POWER FINANCE & INFRASTRUCTURE DEVELOPMENT COMPANY LTD. IS THE CO REGULAR IN PAYING INTEREST & PRINCIPAL ON A TIMELY BASIS. TAMIL NADU POWER FINANCE & INFRASTRUCTURE DEVELOPMENT COMPANY is a wholly owned by the Govt of Tamilnadu. Company FDs come with risks when compared to Bank FDs. But as this company is owned by the Govt of TN, the associated risks can be less when compared to say Pvt company FDs. You may invest in the FD Scheme. But, kindly do not put your entire savings in one Scheme. Can NRIs invest in Company FDs? Yes, NRIs can invest in Company Fixed Deposits through their NRO accounts (Non Resident Ordinary) only. Note that NRI can not transfer the proceeds back to abroad. However, the Company which is issuing the FDs have to take necessary permission to accept deposits from NRIs from the Regulator, then the investor can invest in such a deposit without taking seeking any permission separately. Please suggest me good Company or NBFC FD schemes to invest currently I can Invest 50k, sol please suggest me good and stable company or nbfc fd’s to invest. You may consider HDFC Premium deposits or Mahindra & Mahindra Fin services deposits or Shriram Transport Finance UNNATI Scheme deposits. Sir, I have deposited above 1lakh rs at Pen Books Project partner ship scheme and the maturity date of the same was 2-years back. And now I heard the MD of the same is under treatment and his wife transferred all the property to their relatives. what is the next step we can do in this. Dear Pramod..you may submit your grievance to SEBI as given in the article. One should not invest in only one type of investment option. It is advisable to diversify the investments. Kindly read my article on ‘Collective investment schemes‘. You may submit your grievance to SEBI. Don’t blame Bajaj Finance or the person who recommended. You bought because you wanted more interest, didn’t you? Blame yourself and your greed for your ruin. I invested in JAI PRAKASH ASSOCIATES company deposit without referring the credit rating on wife’s name and my name. Both the deposits were matured on last year December 2014 and the original FD deposits were submitted to the company. As you may aware the company is under trouble and not paying the maturity amount to many customers. The company is applying for extension and company law board is giving time extension for repayment. There was a provision to file a complaint to the CLB against the company. I sent my complaint application to the CLB and CLB replied that as per new regulation CLB are not allowed to take any complaints. Please suggest is there any option to book complaint/ speed up the refund process? Investing in company FDs without checking & understanding the credit rating can have serious consequences like the one you are facing. The law may take its own course. It’s a very long process. You may visit moneylife.in (or) suchetadalal.com and request their help. 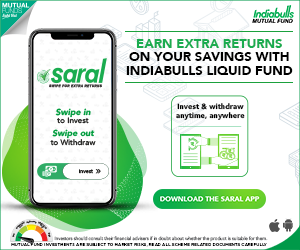 what is the best fixed deposit scheme available in india with best credit rating of CRISIL or ICRA , so you dont loose your money . Yes, though the risk factor is more, Company deposits offer a higher rate of return. Most of the company deposits offer interest rate ranging from 9-15 %, higher than bank deposits itself. For depositors with higher risk appetite, this could be a useful investment tool. Thank you for sharing your views and also the slideshare presentation.